Do Exercise “Weekend Warriors” Lower Their RIsks of Death? Is being a “weekend warrior” and cramming the recommended amount of weekly physical activity into one or two sessions associated with lower risks for death? Yes, according to an article published January 9th online by JAMA Internal Medicine. The study suggests that compared with inactive adults, weekend warriors who performed the recommended amount of 150 minutes of moderate or 75 minutes of vigorous activity in one or two sessions per week had lower risks for death from all causes, cardiovascular disease (CVD) and cancer. 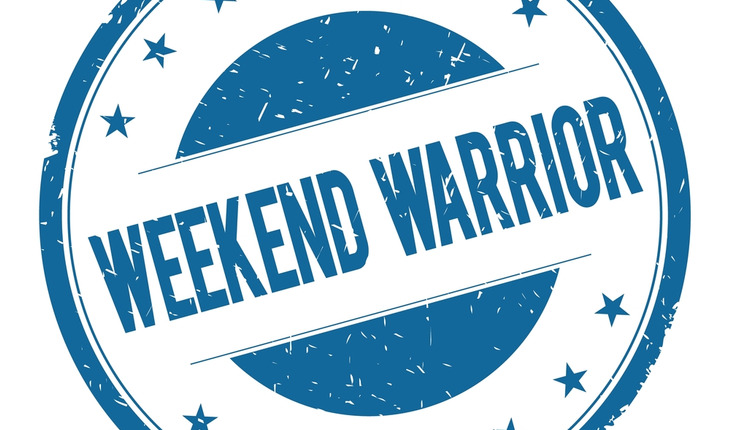 Although it may be easier to fit less frequent bouts of activity into a busy lifestyle, little has been known about the weekend warrior physical activity pattern. A release from the publisher explains that Gary O’Donovan, Ph.D., of Loughborough University, England, and coauthors conducted a pooled analysis of 63,591 adults who responded to English and Scottish household-based surveys. Data were collected from 1994 to 2012. The authors looked at associations between the weekend warrior and other physical activity patterns and the risk for death from all causes, CVD and cancer. Among 63,591 adults (average age almost 59), there were 8,802 deaths from all causes, 2,780 deaths from CVD and 2,526 from cancer. The risk of death from all causes was about 30 percent lower among weekend warrior adults compared with inactive adults, while the risk of CVD death for weekend warriors was 40 percent lower and the risk of cancer death was 18 percent lower. Risk reductions were similar among weekend warriors and insufficiently active adults who performed less than the recommended amount of weekly physical activity. Frequency and duration appeared not to matter among those who met physical activity guidelines. Some evidence suggests the risks for death were lowest among regularly active adults, according to the results. Limitations of the study include that the results may not be generalizable because more than 90 percent of the participants were white. Also, physical activity was self-reported. The study also cannot establish causality. “The weekend warrior and other physical activity patterns characterized by one or two sessions per week of moderate- or vigorous-intensity physical activity may be sufficient to reduce risks for all-cause, CVD and cancer mortality regardless of adherence to prevailing physical activity guidelines,” the study concludes.